It’s no secret that payday loan storefronts often pop up in lower-income communities where consumers are more likely to need a quick infusion of cash to get to the next paycheck. A new report from the Howard University Center on Race and Wealth shines a light on the frequency with which the small-dollar, high-cost loans are opened in susceptible communities in the southern United States. The report [PDF], which studies payday loan practices in Alabama, Florida, Louisiana and Mississippi, found that the most vulnerable communities in those states continue to fall prey to these practices, causing considerable damage to their already compromised financial stability. Overall, the report found that 12 million Americans in these areas use payday loans annually, averaging about eight loans a year. On average those loans originally cost $375, and accumulated nearly $520 in interest charges. Of the consumers who frequented the payday store fronts, most were women. People who were divorced or separated were 103% more likely to use the loans, while African-American’s were also 103% more likely to take out the often predatory loans. 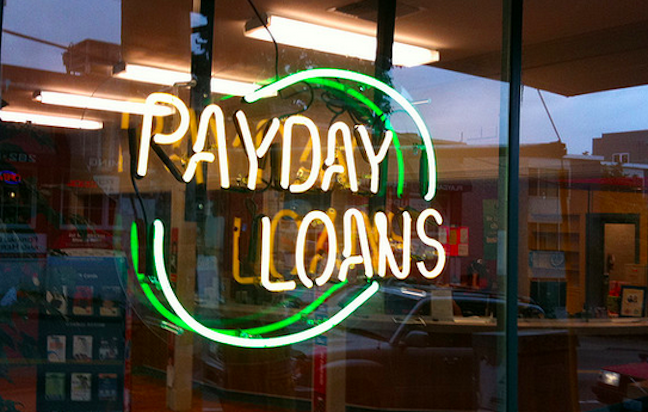 In Florida, payday loan storefronts were found to cluster in areas where income ranges from $20,000 to $60,000. Of the 1,277 stores located in Florida in 2014, more than 1,000 were located in communities where income was between $30,000 to $40,000. The report found that approximately 1,200 of the stores were located in areas that were more than 30% African-American and up to 60% Hispanic. As an example, the report shows that one Miami ZIP code, which has a population that is 83% African-American and 13% Hispanic, had 10 payday stores within its limits. The findings in Alabama were similar to those in Florida. Of the 1,032 payday stores in the state, 976 were located in areas with a high minority population and an income between $20,000 and $60,000. A ZIP code in Birmingham, was found to have 14 payday stores, or two stores per 1,000 people. The area also had a 79% minority population and a 14% unemployment rate. In Louisiana, 960 of the 964 payday loan stores in operation as of March 2014 were situated in communities with a minority population of 20% or higher. A ZIP code within Baton Rouge was found to have more than five payday stores per 1,000 residents. The area has a 85% minority population and a median household income of $49,609. The report found that in many areas of Louisiana with a high concentration of payday stores, the poverty rate of the communities was above 20% and unemployment was as high as 19%. Likewise in Mississippi, payday loan storefront locations appear to be determined by income, race and ethnicity of community populations, the report states. Of the 898 stores in the state, 97% were situated in areas where the income is between $20,000 and $55,000, with a minority population of 20% or higher. Laurel, MS, had 23 payday stores within its limits and a median household income of $32,061 and a 64% minority population. Additionally the area has an unemployment rate of 9.1% and 31.4% of the residents were living below the poverty line. The report went on to investigate the potential effects payday stores have on the community’s economy. As an example, the report points out that a customer who pays about $600 per year for short-term payday loans is also losing $600 worth of savings each year. If these funds were invested in a diversified portfolio over 30 years, it would create savings of $75,000. Therefore, the report hypothesizes, a small community with 200 payday customers would lose about $15 million over 30 years.